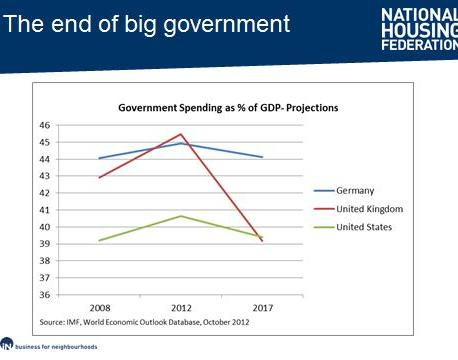 Last week I came across this very informative graph provided by the National Housing Federation that compares projected public expenditure in the United Kingdom with Germany and the United States. It clearly shows that the United Kingdom is heading for an approach to public expenditure that will compare more closely with the United States model than the European model. It should also be remembered that while public expenditure is shown as reducing, capital financing costs are increasing, so the reduction in expenditure on services is actually more rapid than is shown in the graph! I am becoming increasingly concerned about the future of housing associations. It is clear that many in government and in business consider that they are organisations that make poor use of their considerable assets, require considerable subsidies through capital grant and housing benefit, trap residents in benefit dependency and do not make a significant contribution to increasing home ownership. It is already clear that the autumn spending review will provide no resources for social or affordable housing and that the government is asking the larger housing associations to focus on affordable home ownership. The government’s future plans are likely to include moving housing associations towards the private rented sector – possibly including flotation on the stock exchange. Those of us who work in the sector may not share the analysis or welcome the direction of travel but there is a need for us to respond to it! I suspect that the government is also keen to see an expansion of the private rented sector and sees this as the way in which those who cannot afford to buy will be housed. We have updated our brochure that describes the management consultancy and training services that we provide for housing associations. A copy can be downloaded from HERE. On 8th September 2015 I will be chairing a session on the operation of the service charge regime in different forms of tenure at the National Housing Federation’s Conference on Leaseholder and Tenant Service Charges in London. I am looking forward to meeting clients and readers of my blog and newsletters at this event. What powers are being offered to Local Authorities? What has devolution delivered so far in the ‘vanguard areas’ such as Greater Manchester and Cornwall? Will devolution deliver economic growth and solve the housing crisis? How can local authorities and their partners influence the powers that are devolved to their own locations? What are the financial implications and risks of devolution? The two presenters will be Graham Chapman of Nottingham City Council and myself. I am very pleased that Graham has agreed to speak because of his considerable knowledge of devolution gained as Deputy Leader of Nottingham City Council and Chair of the Nottinghamshire Leaders’ Group that is bidding for Combined Authority and City Deal status for Nottingham and Nottinghamshire. The negotiations surrounding this deal are among the most advanced in England and the devolution package being negotiated is one of the most comprehensive. We have also published the August editions of two of our newsletters this week: the AWICS Housing News and the AWICS Welsh News. Rent reductions in Wales - what if? 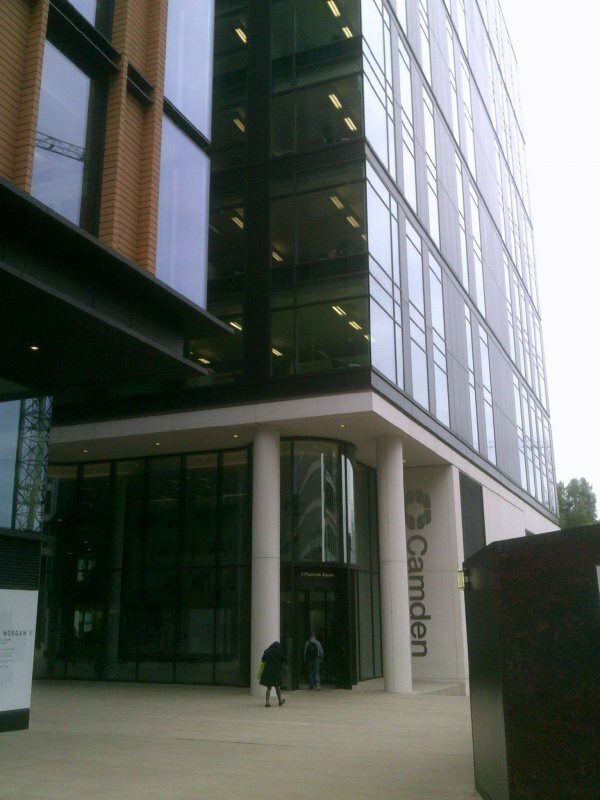 Last week I went to Camden to present an in-house training session on housing finance. It was held in their new offices at St. Pancras Square just to the north of St. Pancras Station. The offices are impressive as they are in a ‘state of the art’ eleven floor building and incorporate a range of modern ideas about office work. When you arrive at reception you are given a card that allows you access to the parts of the building where you are authorised to go. When you go in the lifts you need to identify yourself by showing your card and the system determines which lift you should use. As a visitor you go to the second floor where there is a ‘meet and greet area’ with a café, easy chairs, tables and desks suitable for a variety of meetings and surrounded by an open plan office. After being ‘met and greeted’ I was escorted to the top floor where there are modern meeting rooms with panoramic views over north and central London including views of the Council’s own housing estates and ambitious regeneration schemes. Clearly there are enormous challenges in Camden to meet housing need and to do this in the context of austerity and changing government policy towards social, affordable and market housing. However, the Council is rising to the challenge – for example it has secured the largest local authority affordable housing investment programme in England. Camden Borough Council also runs a ‘paperless’ office so attendees made notes during the training session on laptops rather than on paper and some had to borrow pens to fill in my ‘hard copy’ feedback forms! My travels this week also took me to Leicester which provides an excellent example of ‘localism in action’. 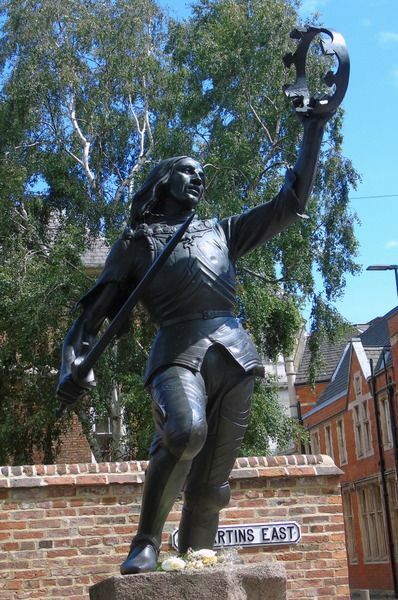 In March 2015 the attention of the world was focused on Leicester for the reburial of King Richard III (1452-85) whose remains had been found beneath a car park at the site of the former Greyfriars Church. Richard’s tomb is now the centre piece of Leicester Cathedral opposite which there is a new and excellent visitor centre provided by Leicester City Council that describes not only the life and death of the King but also the cutting-edge archaeological work that was undertaken by Leicester University. Lessons are also drawn from Richard’s life and times when there were civil wars for the times in which we now live; and comment made about how the King’s reputation has been influenced by propagandists and artists including Shakespeare. The Richard theme (or perhaps ‘brand’) can also be seen in the City’s other historic sites, arts venues, restaurants, shops and hotels. This is clearly a major and successful initiative that is helping to cement a sense of ‘place’ in a diverse community and to promote its tourism and economic development. What is significant to me is that this is a local initiative. It is the achievement of local organisations working together rather than the achievement of national or central agencies. It is Leicester City Council, Leicester Cathedral, Leicester University and their partners who have seized their opportunity and made this happen. I can’t help thinking that there must be enormous untapped potential in all our cities, towns and villages for ‘place shaping’ and ‘economic development’. Leicester had a King buried in a car park but I suspect that every community has something ‘buried’ somewhere that could prove of great value if it could be found and used to its full potential. This week Genesis Housing Association has grabbed the headlines in the housing press by announcing that it will no longer build social or affordable housing but will concentrate on shared ownership, market rent and outright sale. This move is in response to the changes in housing policy that were included in the Queen’s speech and July budget including the extension of ‘right to buy’ to housing association tenants and the reduction in social and affordable housing rents. Clearly the focus of the government’s housing policy is on helping people into home ownership and their budgets are similarly focused on this priority. Providing social housing for people who are homeless or in unsuitable accommodation does not appear to be a priority. In these circumstances I expect that many (but not all) housing associations will follow the lead set by Genesis. If housing associations focus on shared ownership, market rent and market sales, what would be the difference between a housing association and a private landlord? Who will provide social housing for people who are homeless or in unsuitable accommodation and who cannot afford market rents? I posed these questions on ‘Twitter’ on Thursday evening and it provoked an interesting response especially to the second question. My second question assumes that someone should provide social housing. However, who should thatsomeone be? It is often assumed that the mission of housing associations should be to provide social housing and that they should respond to the current lack of government funding for social housing by finding other ways of funding their development. But is this correct? There is an alternative argument that housing associations are private organisations and can therefore decide what services to provide and how to fund them. They are therefore not responsible if a gap in service provision emerges. This argument goes on to say that it is government’s responsibility to deliver social housing and if it is not delivered then the fault lies with the government and not with housing associations. However, what happens if the government does not consider that it has such a responsibility? And where do local authorities stand? They have statutory responsibilities for homelessness and must fulfil these in a situation where the housing market and their finances make it increasingly difficult. Many authorities continue to provide council housing but many do not. Many authorities aspire to build more social housing but they operate within constraints and can they be held responsible if insufficient homes are built?